We all have wished for presentation slides to be a bit more entertaining at one point in our lives. 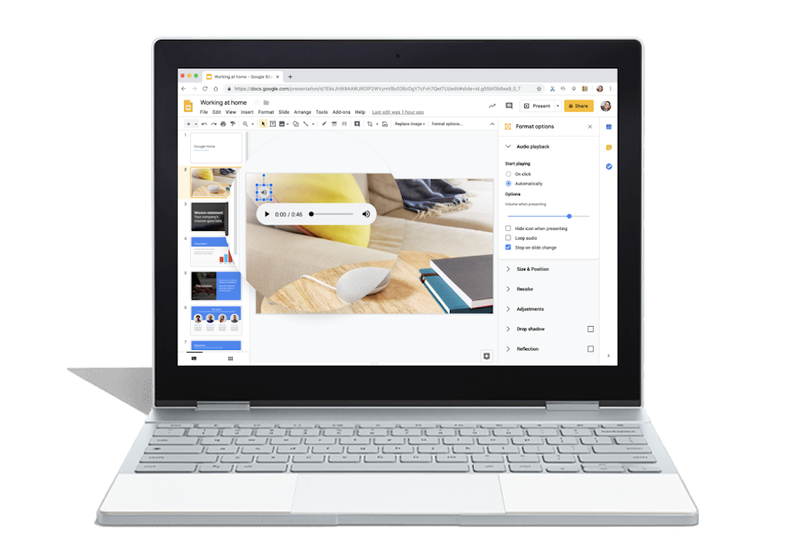 But the idea of it was always either very difficult or vague until now, as Google has finally brought the feature of making you add music to your slides. Sounds surprising, right? According to the web-based power point competitor, you can do this by simply embedding audio clips, belonging to MP3 and WAV format, into your presentations. During a press release, the company also stated that this addition was long due as G-suite users were constantly requesting for it. To avail this feature, click ‘Insert’ in Slides toolbar and upload a file from Drive or your computer. Once done, the volume icon will appear for the playback control along with a seek bar and volume. Going into the Format option on the toolbar, can also help you set the timing of the audio during your presentation. The latest addition has already been rolled out in the G-suite for desktop web (Chrome, Firefox, Safari, and Microsoft Edge) and hopefully it won’t take long for non-G-suite accounts as well. Adding audio clips can help users highlight a point during presentation, grab the attention or even set the tone in some cases.